John Kadlecik has come a long way since playing the Violin in childhood. After leaving the shell of classical music, John was quickly turned on to “basically all music made after the Beatles broke up” and eventually found the Grateful Dead. Through a parallel interest in jazz, Kadlecik honed in on the Dead’s instrumentation and musical approach. 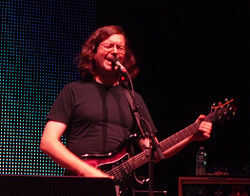 Now, as the lead guitarist of Furthur, John K plays with ex Grateful Dead members Bob Weir and Phil Lesh. When not touring with Furthur, John K takes his own band, the John K Band, across the country to play similar jam-based, diverse music as the Dead and Furthur. The John K Band played the State Theater in Falls Church, VA on Thursday and Friday of last week and called into WGTB for an interview that covered his childhood, influence by jazz guitarists and more.